"Program alarm," Neil Armstrong radioed back to mission control as he eyed the readout on his computer console. "It's a 1202." "1202? What's that?" a voice asked. "It's executive overflow," another voice answered, indicating that Eagle’s computer was doing too many things at once, and was postponing its lower-priority tasks. "If it does not occur again, we're fine." "Roger, we got you, we're go on that alarm," came the reassuring reply. Another clip captures a playful remark about the booze-soaked celebrations that were expected in Houston following the astronauts’ return. "You throw a match in that Clear Lake area, and it'll explode," says a voice in mission control. 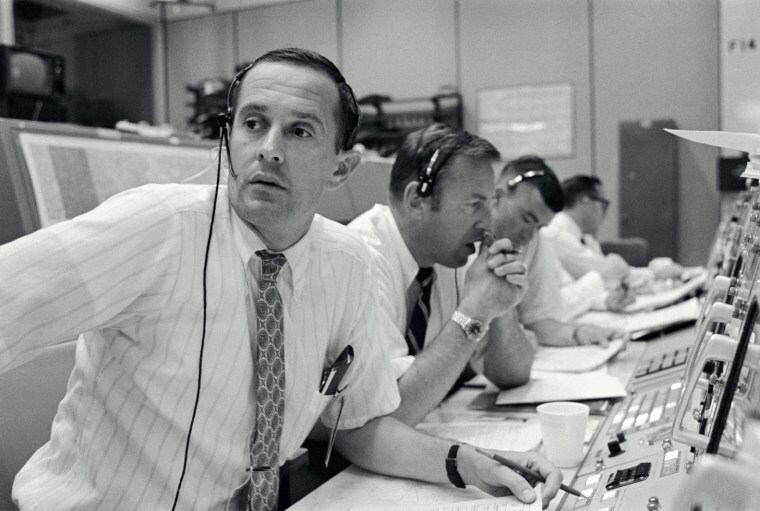 Mission control also helped the crew feel connected to Earth by reading the day's news. In one such instance, the news roundup ends with a story about an oatmeal-eating contest. "I'd like to enter Aldrin in the oatmeal-eating contest," says Collins. "He's on his 19th bowl." NASA's mission control center was, and still is, located in the nondescript Building 30 on the campus of Johnson Space Center in Houston, Texas. The main Apollo control room, which is currently being restored, had 20 computer consoles arranged in four rows, facing large screens displaying critical information. Numerous personnel in other rooms, all connected via headsets, supported the mission — and the most critical conversations were recorded. So Hansen's team ordered a custom-built read head that allowed all 30 tracks to be played back at the same time. This shaved the digitization time down to four months. NASA has uploaded all of the audio to the Internet Archive, a nonprofit website that hosts cultural artifacts in digital form. Right now, it's hard for casual users to make sense of the files, so Feist, who previously built a website for Apollo 17 allowing visitors to relive the mission in real-time, is organizing the audio to make it more accessible. He hopes to have a new Apollo 11 portal built in time for the mission's 50th anniversary next year. Greg Wiseman, a NASA engineer who worked on the project, said the ultimate goal is to identify all the voices on the tapes and pay tribute to all the people who helped orchestrate one of humanity's biggest moments. "Once the audio gets out there, maybe people will say, 'Hey, that was my Dad, or that was my Granddad,'" he said.